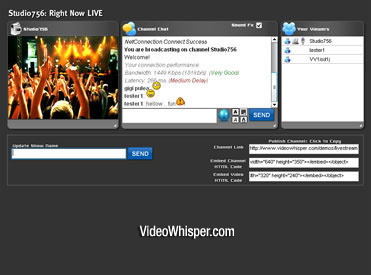 VideoWhisper Drupal Live Streaming provides web based live video streaming easy to setup on Drupal sites. This application contains an application to broadcast video with realtime configuration of resolution, framerate, bandwidth, audio rate and also allows discussing with video subscribers. The live broadcasting application also saves snapshots of current video as images for preview purposes and provides links and html code to publish channel and preview. This integration is provided as a GPL module. Modules are available for Drupal6 (older) and Drupal7. The module manages configuring the live streaming software, creating live video channels with mutliple settings, listing rooms, accessing channel links and removing channels. Drupal 7 integration includes Drupal Pay Per View Streaming support. After registering and login in, use Create Content / Add Content > Live Streaming channel or Live Channels: Create New Instant Live Streaming Channel from the user menu to create a channel for testing. Older Drupal6 integration demo can be tested by registering a free account on the Video Conference Software Drupal 6 powered website. Drupal 6 modules integrate older application versions, limited functionality and is no longer upgraded. How does Drupal Live Streaming integration work? Site members (as allowed by role permissions) can instantly create video channels and send the access links to other participants. Channels are created as Drupal nodes. Links are provided and can be shared by any method (email, instant message). With this Drupal integration, channel settings, including quality and streaming time, permissions to use features (globally by role and locally by channel) can be defined and used to control quality and duration of service. This virtually allows website owner to provide controlled premium services. Latest editions for Drupal 7 also include (and require) a listings module (vwrooms) that lists all rooms based on custom filters and ppv (pay per view) support configurable with a special module (vwcredits). - Install and enable Live Streaming (vls) module. Should be in VideoWhisper category. Click Configure for Live Streaming on Modules screen, and fill your rtmp application path (get it from step 1). Change other settings as desired. Click Permissions for Live Streaming on Modules screen and enable permissions as desired. Important: The standard Drupal 6 module contains just the intgration. You will also need to have the videowhisper application (which does not come with the regular tag.gz) copied to the website by FTP. If you already installed the drupal module, just copy the vls folder and contents to the root of your drupal installation. Login to your Drupal administrator account and go to Administer > Site Building > Modules in Drupal 6 or Modules from dashboard in Drupal 7 and enable Live Streaming. Should be in VideoWhisper category. Go to Administer > Site Configuration > Live Streaming in Drupal6 or Live Streaming : Configure in Drupal7 on Modules screen, and fill your rtmp application path (get it from step 1) and other settings. Go to Administer > User Management > Permissions , scroll down to vls module in Drupal6 or Live Streaming: Permissions in Drupal7 on Modules screen and enable permissions as desired. After installation a new menu will be available for users: Live Channels. This will allow managing channels created by that user and creating new channels. Channels can also be created with Create Content > Live Streaming channel. Channels are generated as Drupal nodes. Channel owners can define for each of their rooms multiple advanced settings, depending on permissions configured by Administrator. This includes streaming settings and permissions (access) to certain room features. Administrators can configure permissions to use certain features for each role. This can be used only if enabled by channel owner for that room.